The looming threat of sliding oil prices forced the Bank of Canada to drop its trend-setting interest rate Wednesday, a surprising move that shows just how much the country's economic outlook has soured in a matter of months. The central bank, which nudged its key rate down to 0.75 per cent from one per cent, said the rapid oil-price collapse has created many unknowns around economic growth in the oil-exporting nation. Until the effects of oil's late-2014 tailspin started to trickle through, Canada appeared to be on the cusp of a promising post-recession rebound — and inching closer to a rate hike. "The drop in oil prices is unambiguously negative for the Canadian economy," governor Stephen Poloz said. "Canada's income from oil exports will be reduced, and investment and employment in the energy sector are already being cut." The central banker noted there will be some offsets, but said they will be partial and of uncertain timing. "Canadian consumers will spend less on energy, but they could save some of the windfall rather than spend it; U.S. economic growth will be stronger, which — along with a lower Canadian dollar — should boost Canadian exports, but the speed of the export response is uncertain given the export capacity losses of the last decade," Poloz said. The loonie dropped after the announcement by 1.12 cents US to 81.48 cents US — its lowest level since late April 2009, the last time the bank cut its overnight rate. The decision Wednesday marked the first time the rate budged at all since September 2010 when the central bank raised it by a quarter point to one per cent. The Bank of Canada was widely expected to once again stand pat on its rate Wednesday, with most economists projecting an increase in late 2015 or early 2016. The central bank, however, predicts the impact of falling oil prices to overshadow encouraging signs of economic life spotted outside the weakening energy sector, such as rising foreign demand, a boost in exports and job growth. "The oil-price shock is occurring against a backdrop of solid and more broadly based growth in Canada in recent quarters," the bank said. "While business investment had been showing some encouraging signs in the third quarter of 2014, the near-term outlook appears much-less positive." The bank also said the oil-price drop will have an adverse effect on income and wealth, which would reduce the growth of domestic demand. It also expected additional negatives on consumption and public finances. The rate decrease aims to soften the blow of cheaper crude by providing "insurance" against risks posed by low oil to the country's inflation and its financial stability. It predicted Canada's fortunes to also receive a boost from the ever-strengthening U.S. economy, an country expected to benefit from lower crude prices. The bank's concerns over the oil slump come as some Canadian industries reel from the sharp plunge in crude prices, which are down more than 55 per cent since June. The decline in oil prices is also expected to shave billions of dollars from the bottom lines of federal and provincial governments. Last week, the federal government took the rare step of delaying the budget until at least April, so it could assess the effect of tumbling crude. In November, federal Finance Minister Joe Oliver warned falling oil prices could cut $2.5 billion per year from the federal books between 2015 and 2019. Since that calculation, the price of crude has tumbled even further, from about US$80 per barrel to under US$50. Experts believe the federal books for 2015-16 will come close to running another deficit, despite the Harper government's assertions it will deliver on its long-held vow to balance the budget. An analysis Tuesday by the Conference Board of Canada predicted plummeting world oil prices to gnaw $4.3 billion from the Canadian government's 2015 income and deliver a nearly $10-billion hit to the provinces in royalties and tax revenue. In the monetary policy report Wednesday, the central bank predicted the country's headline inflation rate to temporarily dip to one per cent — below the bank's target range — before climbing back up to two per cent in the second half of the year. The central bank also highlighted persistent problems in Canada's labour market, where it found long-term unemployment was still close to its "post-crisis peak." It said average hours worked remained low and the proportion of people who could only find part-time work was still high. The bank predicted the pace of Canada's economic growth — measured by the real gross domestic product — to slow to roughly 1.5 per cent in the first half of 2015 and for the output gap to widen. It projected the Canadian economy to gather steam in the second half of the year, allowing real GDP growth to average 2.1 per cent in 2015 and 2.4 per cent in 2016. The bank's estimates were based on oil prices of US$60 per barrel, which is higher than current prices that are below US$50. The report said if oil were to remain close to US$50, real GDP growth would dip to 1.25 per cent in the first half of 2015. 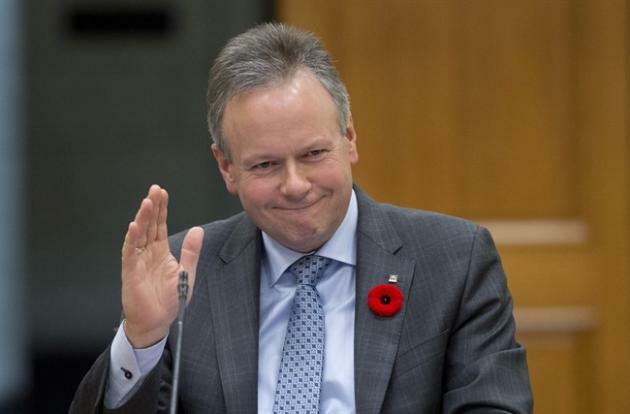 In its last monetary policy report — in October — the Bank of Canada predicted 2.4 per cent growth for 2015. Since then, oil prices have dropped by more than 40 per cent. In his October report, Poloz warned the extended period of an already-low interest rate of one per cent had propelled consumer spending to near-record-high housing prices and debt. At the time, Poloz cautioned the low-rate environment had left Canadian households exposed to economic shocks. On Wednesday, the bank reiterated the warning that Canada's indebted households remained vulnerable. A fresh unknown — the oil collapse — has now been added to the mix. "The precise magnitude of the impact of the fall in oil prices on household income, spending and, ultimately, on existing imbalances is highly uncertain," said the report, which still maintained its prediction of a soft landing for the housing market. The Bank of Canada is scheduled to make its next interest-rate announcement March 4, while its next monetary policy report is due April 15.